Outdoor eateries aren't necessarily what New York is known for, but that's changing. NEW YORK (MainStreet) -- Spring has sprung and there's nothing New Yorkers like more during this season than dining outdoors and forgetting they are in the middle of a concrete jungle. TravelsinTaste has gathered the latest in outdoor dining to sample whether you're a tourist or a native New Yorker, so you can forget about the jungle for a while and savor the fresh air and fine cuisine. For rooftop dining a wonderful respite in the midst of Midtown is the rooftop at Aretsky's Patroon. With just the right sense of fun, frolic and, of course, lush foliage, the rooftop space provides the perfect escape from bustling Midtown. It's more casual than the restaurant and great for a drink or a light bite of shrimp cocktail or Angus prime beef sliders. 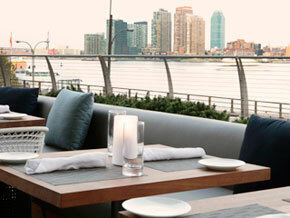 The Patio at Tom Colicchio's Riverpark gives diners a beautiful view of the East River. On a quiet block in Hell's Kitchen Ardesia's 34-seat outdoor patio is the ideal setting to enjoy Chef Amorette Casaus' playful dishes made for sharing such as homemade New York-style pretzels and Duck Banh Mi, accompanied by selections from the restaurant's diverse wine list. Bravo's Top Chef Judge Tom Colicchio's Riverpark isn't his first foray into New York dining. He also owns Craft, 'wichcraft and Colicchio & Sons in NYC. Riverpark boasts two outdoor spaces in Kips Bay, The Patio and The Terrace, where guests can enjoy executive chef Sisha Ortuzar's flavorful modern American cuisine while taking in the unparalleled East River views. The John Dory Oyster Bar features sidewalk seating for 26 people in NoMad. Guests can delight in April Bloomfield's signature seafood dishes and Sasha Petraske's expertly crafted cocktails, while soaking in the sun, and after-work guests can take advantage of the $15 happy hour special of a half-dozen oysters or clams and a glass of bubbly or pint of oyster stout from 5 p.m. - 7 p.m. daily. Bobo, located in a centuries-old townhouse in the West Village, features a 38-seat outdoor garden where guests will soon be able to enjoy chef Cedric Tovar's new menu of classic French bistro fare. The menu includes dishes such as steak tartar or bouillabaisse de poisson epicee that can be paired with flavorful cocktails like the Embers Only, which blends smoked bourbon, root and black walnut bitters. For those looking for the energy of the Lower East Side you can find it at Sauce, the newest restaurant from Frank Prisinzano (Frank, Supper, Lil Frankie's). The restaurant recently opened its seasonal 34-seat sidewalk café where guests can enjoy Prisinzano's flavorful Italian cooking with dishes such as Pecorino Kale salad and Filetto Di Pomodoro along with a thoughtfully curated wine list. Guests who dine in SOHO's David Burke Kitchen's unparalleled outdoor garden can enjoy a full menu and sun-brewed iced teas while relaxing under airy cabanas surrounded by landscaped herb beds, flowers and sculptures made of recycled materials. Located steps away from the Meatpacking District's fashionable boutiques, Scarpetta's sidewalk cafe allows guests to people-watch while sampling Celebrity Chef Scott Conant's signature house-made spaghetti with tomato and basil along with his duck and foie gras ravioli. Looking for something more American? The Standard Grill's 92-seat outdoor cafe is a lively spot in New York City's Meatpacking district to spend the day or night. Executive Chef Dan Silverman's menu features updated takes on American classics as well as raw bar items such as East & West Coast oysters and Alaskan King crab legs. The Upper East Side has a number of notable outdoor spaces. For Sunday brunch and dinner, guests at David Burke's seafood restaurant, Fishtail by David Burke, can opt to sit on the 25-seat outdoor dining patio while enjoying sushi and sashimi, lobster with vegetable lasagna or their choice of whole fish available grilled or steamed with a variety of flavorful sauces. Burke also owns david burke townhouse around the corner. Otherwise, Marche De Sud's garden on the Upper East Side is a perfect place for an evening get-together with friends from the neighborhood. Co-owners and noted chefs Adil Fawzi and Anthony Raggiri prepare their tarte flambee, a very elegant, thin-crust pizza with just the right French touch. It is the perfect light bite to share with a glass of wine amongst the lush greenery in the garden. The owners also co-own Bistro 61, which has its own take on an outdoor Paris café right on First Avenue.